Want a Bunion Bootie Coupon? No Need, Just Buy At Least Two (2)! Looking for a Bunion Bootie Coupon? Most people do, so we offer special Bunion Bootie discounts when you buy at least two! Buy 1 for each foot and save $10! 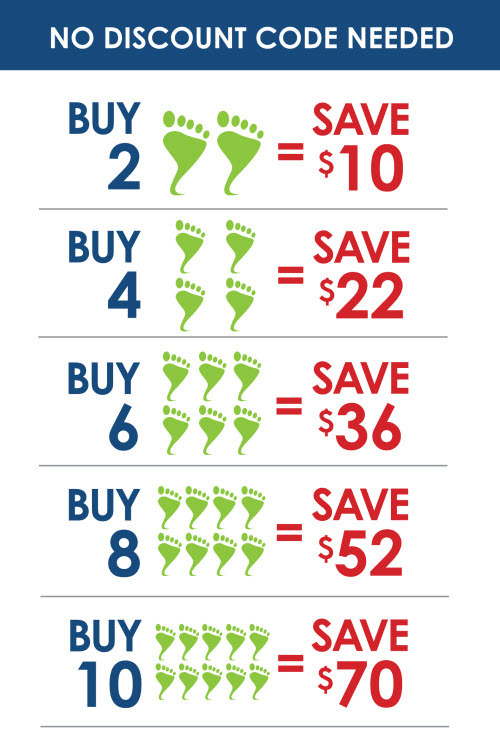 Buy an extra Bunion Bootie for one foot so you can always have a clean Bunion Bootie and save $10! Buy a set for day, and a set for night and save $22 and receive free shipping! Buy more and save up to $70 and receive free shipping with your order! Discounts are available for orders of 12 or more, just email us at CustomerService@BunionBootie.com. No Bunion Bootie coupon code required. Bunion Bootie reserves the right to modify the available discounts offered on this site at any time.